I don’t think this work needs any explanation. Even the title is an afterthought that is only necessary so people can refer to it by some name. Nevertheless, there are a few things I want people to notice. The details are important to me, so we can start off by looking at some of those. Before I discuss the content, I’d like to consider what kind of creation the piece is. It’s a new image in the tradition of image-making using visual language, and it attempts to add something to the collective imagination. In contemporary art, this is taboo. You should do anything BUT this. The reason is because this is the kind of thing that people who don’t know anything about art theory tend to think art is. Art theory in the last decades has been used to validate every other kind of art, in order to prove that it is art, but there doesn’t need to be a rhetorical justification for this kind of art, because it’s a very direct approach that everyone can understand. There are at least two paths artists can take. One is to come up with some new mode of art making, and the other is to try to do something new with a language that is thousands of years old. I could do either (I did a lot of conceptual art in college), but my true love is for the latter. I also consider this a painting. True, it uses a drawing tablet and stylus, rather than paint and brushes, but it is rendered by hand using my imagination, and the process is not meaningfully different from when I make physical drawings or paintings. At this stage in my use of computer programs, it’s becoming easier to get more painterly results using my PC than with traditional mediums. This is more obvious if you see how it looked in different stages, in which case it’s just easier to think of it as a painting than as digital art (unlike some of my other pieces, which are more about the digital possibilities). About the content. The main thing is just the kid’s fascination with the fish. A lot of us, and definitely me, love fish, and have spent a lot of time looking in aquariums in fish stores or public aquariums. Even better for a kid, or even an adult, if you can combine looking at fish with eating ice-cream. OK, originally I used a big, round, lollipop, but when I started to think more about the meaning of the piece, I realized that I don’t really like hard candy, and ice-cream would be a much better choice. Also, from my own perspective, this kind of rare-looking, monster fish would be the most captivating. At the same time the boy is eating his ice-cream, the fish is eating one of its tank-mates. If you’ve kept any largish, carnivorous fish, you know that goldfish are often their feeder meals. This introduces a little bit of cruelty into the picture, though the cugly fish has just gobbled up another fish as a reflexive act, without any intelligence behind it. The kid looks vaguely startled, and it could be that he just noticed the big fish gulping down another fish, or it could be that he caught his own reflection in the back of the aquarium. If you looked at the in-progress pics, you probably noticed that the fish was originally facing the boy, and then I flipped it around. This was to allow us viewers to see the faces of both, and inevitable comparisons. I was hesitant to rotate the fish because I wanted the boy to have the best view of it, but after flipping it, I still felt like the boy was looking at the fish head on, and this was because my mind was interpreting his visage as a mirror image. That gives us the vantage of seeing the kid catching himself in the mirror, eating up the act of the big fish eating another. But he could also be just discovering this rare, bizarre fish (yes, it looks a bit like an angler, stone fish, and a mudskipper, but it’s an imaginary combination of them). 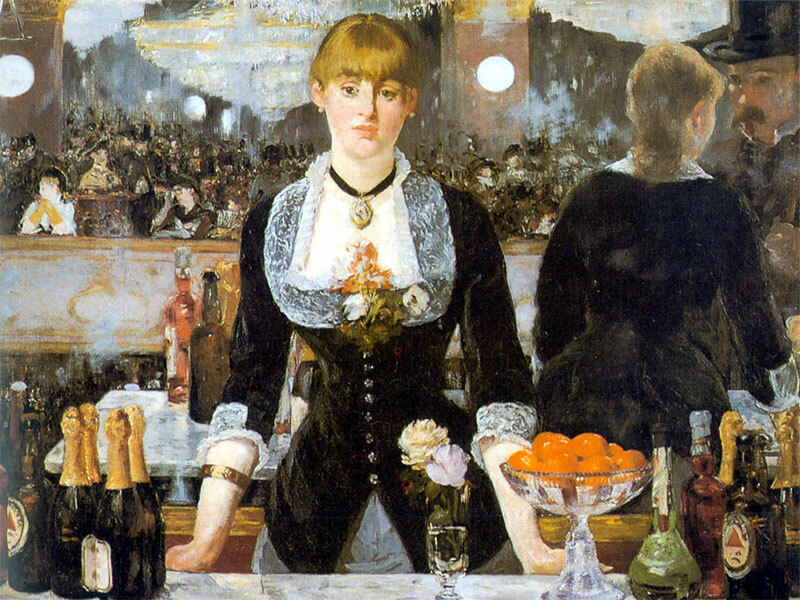 Manet did something similar in his painting of a young woman at a bar, below. As I recal, the man in the mirror, on the far right, is a self portrait (mind isn’t). “The Aquarium” also relates to at least a couple of my earlier pieces. One is a pen drawing of a girl eating an ice-cream cone that turns out to be a “Seafood Sorbet“, below. Seafood Sorbet, Marker on paper. 10×10″ 2014. Click to go to a post about this piece. And the other is an acrylic painting from over 20 years ago – The Menagerie – of a man looking in a window at a two-headed girl, presumably on display in a freak-show type setting [incidentally, if you are a collector and you want a one-of-a-kind original, this one’s for sale. Oh, and so is the drawing above.]. The Menagerie. [Acrylic on Canvas. 3X4 feet. @1990]. Click to go to a post about this. Lastly, the title indicates that the fish is for sale. I imagine the kid really wants to buy the ugly fish (I know it’s not REALLY ugly, but rather awesome), keep it as a pet, and shower it with love and attention. Overall, it’s a whimsical piece, about some of the slightly oddball pleasures in life, small ironies and self-reflectivity, as well as being a testament to the death-defying tradition of image-making with visual language (or “painting”). Click to go to order page. Posted in artTagged aquarium, art, digital art, Expressionism, fish, painting, ugly fishBookmark the permalink.